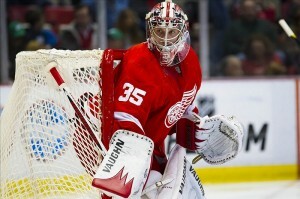 Jimmy Howard’s frozen body and bewildered stare midway through the 2nd told the story better than any wordsmith could. He had just given up his 2nd goal of the evening, and it was the 2nd one to leave him helpless and puzzled. First a bad bounce off Brad Stuart’s skate found its way into the net, and now a seemingly harmless shot from the point had deflected past him to put his team down for the 2nd time. It was a defect they would never recover from. The game’s final score? 3-2 Predators. Yet in this game of inexplicable bounces and astonishingly confusing goals, there was more, as Red Wings color commentator Mickey Redmond put it, “tomfoolery,” about than that. At the opposite end of the ice from Howard was a stout, unwavering Pekka Rinne. The Red Wings out-shot the Predators by a 37-26 margin. Rinne was excellent in nearly every instance. He made the saves he was supposed to, and even a couple he wasn’t. The 2 he faltered on? Garbage goals scored on the powerplay. Heading into the game all were aware that special teams would play an important role in deciding the tightest battle in the West. If game 1 is any indication, that expectation is spot on, but not in the way you’d expect. without rendering goal against. While that figure may have turned some heads, more were turned at the sheer number of infractions called. There were 16 minor penalties called during the game, which pitted the league’s 2 least penalized regular season clubs each other. I can find justification for about 5 of them. Red Wings coach Mike Babcock too felt that the referee work for the game was sub par. His comments echoed the sentiments of nearly every hockey fan who laid eyes upon the game. There was no apparent bias to be witnessed. No argument can be made of rigging the series. The calls were split evenly, 7 putting Detroit in the box, 9 the Predators. The complaints instead were focused on the soft nature of the calls. Interference penalties called for simple shoves. Tripping penalties called when players merely slipped. Perhaps most confusingly, diving and hooking penalties called on the same play. How can one be guilty of hooking if their opponent dove, and vice versa? The calls were truly abysmal. The oft suggested reason for their disgraceful nature? League Commissioner Gary Bettman was seated squarely in the stands, and the reminder that officials too want to make the Stanley Cup Finals. Perhaps they were more nervous with the boss’ eyes looking down from above. Perhaps they were trying to make an impression. Or perhaps they had one of those now infamous celebratory beers before the game instead of after. The whistle frequency never allowed the game to enter any kind of flow. No momentum was allowed to be built. No real 5-on-5 game was ever played. Rounding out the general insanity was an injury to Detroit’s 3rd line center, Darren Helm. In his first game back from a grade 2 MCL tear suffered on March 17th Helm took a skate to the wrist, leaving the game after playing just 3:08 seconds. Taken to the hospital for testing, Helm would not return, and was later rumored to be in surgery. If the injury is anything similar to the one the now retired Mike Modano suffered just a season ago, Helm will be out of the lineup for a long time (Modano missed 3 months). The final note of the game? The only thing more abominable than the officiating. Predators captain Shea Weber was assessed a roughing penalty at 20:00 of the 3rd period (the 17th of the game) for his dishonorable actions detailed in the following clip. Do you think Weber gets a call from Brendan Shannahan for this one? In the end, the Predators won as a result of play from their MVP worthy netminder Pekka Rinne and a little help from the hockey gods. They faced adversity and rose above it. Detroit faced adversity and got smacked in the face with a paddle that read “bad luck.” They outplayed the Predators for most of the game, yet the score board did not show the same. 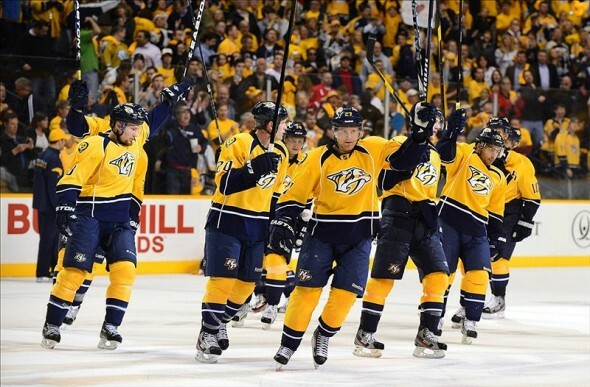 They’re easily poised to steal a game on Nashville’s ice Friday when game 2 is played. Hopefully they’ll use their frustrations and the childish actions of their opponent’s captain as fuel for a high-flying attack and subsequent victory. It’s a 7 game series, there’s no reason for concern.